This action provides the ability to create Zip files. Zip Action : The ZipAction property determines whether files will be replaced in a zip or not. If ZipAction is set to zaUpdate then a zip entry will only be replaced if the disk file is newer than the zip entry. 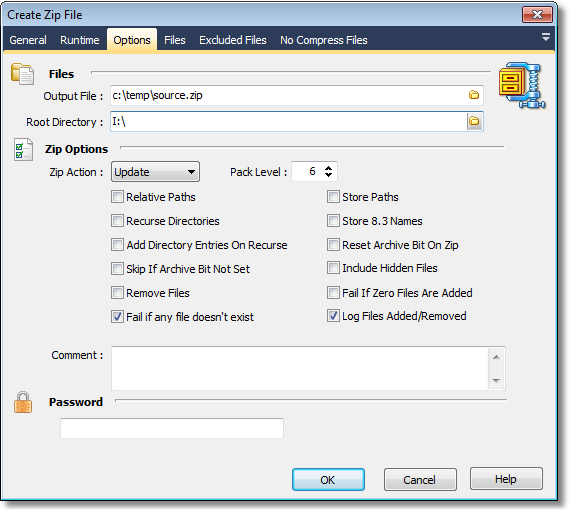 If ZipAction is set to zaReplace, then the zip entry will be replaced by the disk file regardless of the file dates. A ZipAction of zaFreshen is the same as zaUpdate, except that filenames that do not match any entries already in the zip file will be ignored and not added to the zip. Pack Level : The PackLevel property determines how hard the compression algorithm will try to compress files. This property can be given a value from 0 through 9. A value of 0 is no compression at all (STORED) which is useful for adding things like other zip files (which will compress very little if any) to an archive. A value of 1 will compress the fastest, but the compression ratio will be the lowest. A value of 9 will compress the slowest, but the compression ratio will be the highest. You may specify particular files that you do not want to try to compress by adding their filespecs or wildcards to the NoCompressList. Relative Paths : The Relative Paths property should be set to True if you wish to save path information but only wish to save path information relative to a specified directory. The only path information that is saved is for subdirectories below the specified directory. This is similar to the Relative Path option of PKZip for Windows. Whenever you set Relative Paths property to True, the Recurse Property and the Store Paths Property are automatically set to True also. Likewise, if the Store Paths Property is set to False, then the Relative Paths Property is automatically set to False also. Store Paths : The StorePaths property, if set to True, will cause path information to be stored with the zip entry. If the StoreVolumes Property is set to True then the entire path will be stored. If the StoreVolumes Property is False, then only the path information will be stored. If StorePaths is False, then only the filename itself is stored. Note that if the RelativePaths Property is set to True, then this StorePaths property will automatically be set to True also. Likewise, if the StorePaths property is ever set to False, then both the RelativePaths and the StoreVolumes Property will automatically be set to False. Recurse Directories : The Recurse property determines whether subdirectories will be recursed to look for files to be compressed when zipping with a wildcard mask. Set to true if you wish subdirectories to be traversed. If this value is set to True, and a wildcard mask is specified in the FilesList without any path information, then the value of the RootDir Property will determine which directory zipping will start in. Results may be unexpected or even bad if you do not supply path information either in the FilesList or the RootDir Property. Store 8.3 Names : When set to True, this will force any long file and pathnames to be stored in DOS 8.3 format. This is useful if you plan to unzip the files onto a WIN3.X system where long filenames are not valid. Add Directory Entries On Recurse : If Add Directory Entries On Recurse is True, then when you do a recursive search through subdirectories (Recurse = True) a separate entry will be made in the archive for each directory. This will allow even empty directories to be restored. If Add Dir Entries On Recurse is False, path information will still be stored with each file that is compressed, but a separate entry will not be inserted for the directories. Root directory : The RootDir property determines where zipping will start for any wildcard entries or filenames in the FilesList Property that do not already include path information. Essentially, the value of RootDir will be prepended to anything in the FilesList that does not have any path information when zipping. Also, when storing relative path information using the RelativePaths Property, you must use this RootDir property to specify the directory from where path information will begin being saved. Skip if Archive bit Not Set : Setting this to True will cause files that do not have their Archive Bit set (turned on) to be skipped during zip operations. Therefore, while this is set to True, only files with their Archive attribute turned on will be zipped. Reset Archive bit On zip : Setting this to True will cause the Archive Bit for each file to be reset (turned off) after being zipped. Remove Files : The Remove Files property, if set to True, will cause the original disk files that were added to the zip file to be deleted from the disk, in effect, moving the files into the zip file. USE THIS OPTION WITH EXTREME CAUTION. If an exception occurs during processing, files will not be Deleted. Fail If Zero Files are Added : Fail If Zero Files are added to zip file. This will cause the run to stop unless the ignore failure property is set. The Files Section allows you to specify the files that will be added to the zip file. You can use Wildcards (*, ?) and FinalBuilder variables when specifying the files. The Excluded Files section allows you specify file that should not be included in the resulting zip file. You can use Wildcards (*, ?) and FinalBuilder variables when specifying the files. 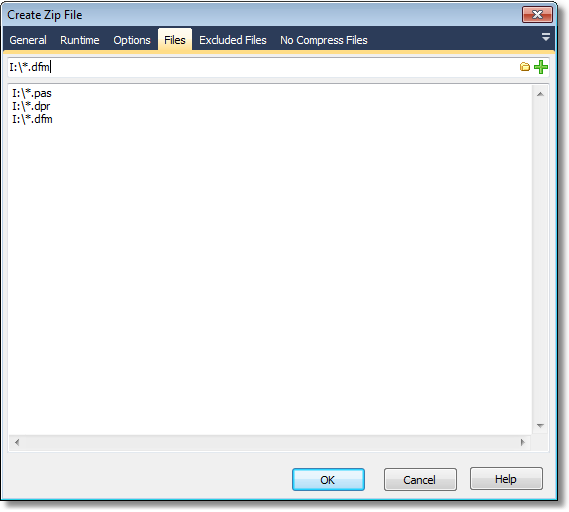 The No Compress Files allows you to specify files that should be added to the zip file but should not be compressed. This is useful for adding other zip files. You can use Wildcards (*, ?) and FinalBuilder variables when specifying the files.